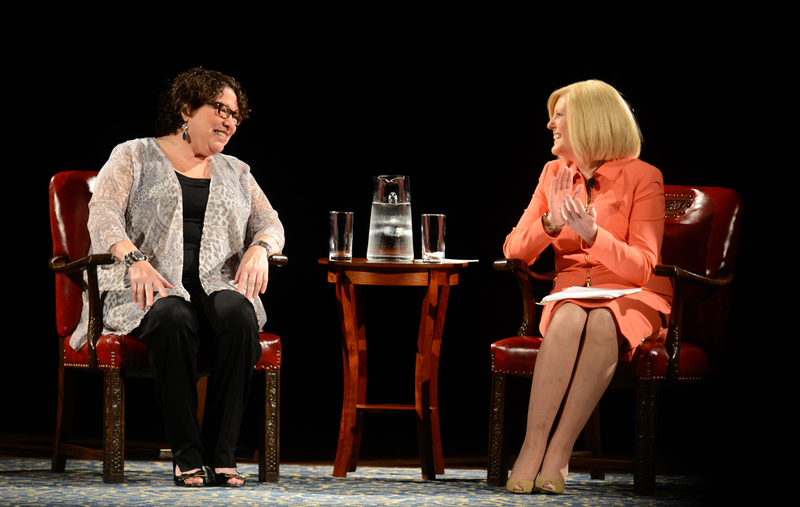 U.S. Supreme Court Justice Sonia Sotomayor discussed a wide variety of issues, including court procedure and diversity, in a public conversation with NBC News correspondent Anne Thompson at Leighton Hall in DeBartolo Performing Arts Center (DPAC). Students and faculty from across the University attended the discussion, which was moderated by U.S. Court of Appeals Judge Ann Claire Williams. Sotomayor, who Williams described as a “dreamer of big, impossible dreams,” said the day she accepted her nomination to the Court was a profound moment in her life. When entering the room behind President Barack Obama and Vice President Joe Biden, she said she felt a sense of detachment from reality. Supreme Court Justice Sonia Sotomayor, left, converses with NBC news correspondent Anne Thompson, a member of the Notre Dame class of 1979, on Wednesday night in the DeBartolo Performing Arts Center. When Thompson, Notre Dame class of 1979, asked how justices reach decisions on court cases, Sotomayor said the process relies heavily on personal interaction and discussion. The justices then hold a conference amongst themselves and disclose their opinions and reasoning, Sotomayor said. Sotomayor acknowledged that while the justices can hold conflicting opinions, the justices’ commitment to upholding the Constitution unites them. When asked what the inclusion of women as justices brings to the Court, Sotomayor said the Court started ruling on cases that supported women’s rights. Sotomayor said that since her appointment to the Supreme Court she has realized the humanity of the people involved in making history. “We are ordinary human beings, with strengths, with weaknesses, with foibles, with courage, and sometimes fear. When we get disappointed in our elected officials, often it’s because we see the human side of them,” she said. “That doesn’t mean we should respect them less but that you should respect them because they’re trying to do jobs that are hard. The crowd was taken aback when Sotomayor responded “no” after Thompson asked if she felt as if she “belonged” on the Court. Sotomayor said she has learned to respond to differences as an opportunity to learn something about new institutions, people and situations. “For me, it’s very, very important not to think of differences as good or bad, but just different, and understanding what moves people to the choices they make,” she said. After her discussion with Thompson, Sotomayor responded to questions posed by Notre Dame undergraduate and law students. In answer to a question about her experience of discrimination as a successful Latino woman, Sotomayor said expectations for women of color are higher than for the average citizen. She also said discrimination can come from unexpected places, and often results from misunderstanding and miscommunication. In the face of discrimination, Sotomayor said, people have a choice – either to retreat from a negative experience, or to try to reach a greater level of mutual understanding and respect with those who have offended them. Indeed, Sotomayor said making friends, particularly with people of differing opinions, is invaluable for personal growth. She said although she has found it difficult at times, she has been able to maintain friendships with other justices on the Court despite their opposing outlooks. “We disagree with each other, but we do listen,” she said. “We try to persuade each other, we try to convince each other, and often we fail. Sotomayor said one failing of the Court as a whole is its lack of diversity – not only in terms of gender or race, but also in terms of the legal backgrounds of the justices. She said all current justices on the Court were prosecutors, and only one, Ruth Bader Ginsburg, has a civil rights background. The members of the Court are not the only ones who could benefit from being more well-rounded, Sotomayor said. Addressing the students present, she said college students should take advantage of opportunities to expand their learning in a variety of areas. In particular, Sotomayor said taking courses in religion, economics, sociology and philosophy are essential for understanding current events. “When you leave this university, you should have a working knowledge of all the things that affect the human condition,” she said.